Today, journalism is not only the hands of news reporters, but also in those of normal citizens. Social media outlets like Facebook and YouTube have helped aspiring journalists reach their audiences. Story Maker brings the art of storytelling to the hands of these journalists. Tips from the experts and story frameworks help citizens create and share professional-looking stories anywhere, anytime. When creating a new story, StoryMaker asks a series of questions to help the user discover a purpose and their approach for telling a story. The video below demonstrates the story starter series that helps users define the purpose and get started. From the responses, the app generates a story path. 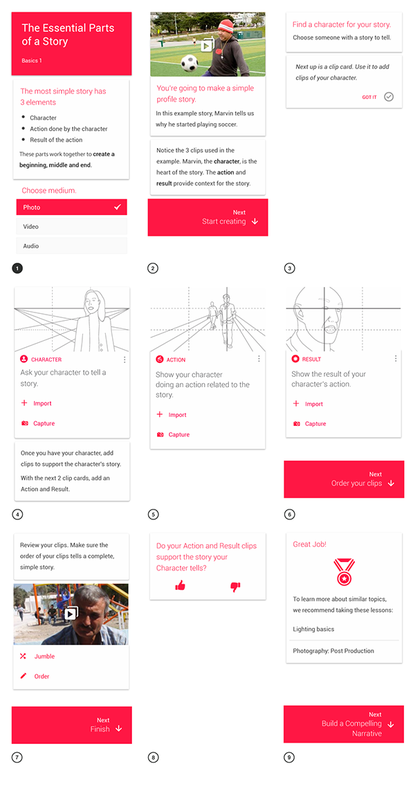 This story path contains a set of storyboard cards that tell users what type of content to gather and gives tips relevant to the type of media the user is gathering. Users can easily add, remove, change and re-order clips within a story path. Learning guides are short self-directed tutorials that walk a creator through the story making process. The original curriculum was written by Brian Conley. In designing the cards for the tutorials, we considered how people learn and created ways to accommodate different learning styles and levels, as well as maximize the experience for self-directed learning. Below are qualities of the story cards that address these considerations and reflect our research insights. Story Maker brings the art of storytelling to the hands of journalists.